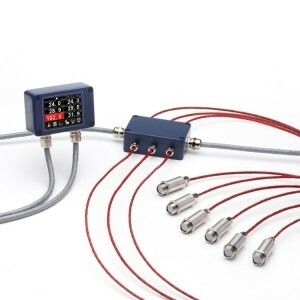 A sub-network of up to 6 pyrometers with RS485 Modbus communications, such as the PyroMiniBus, can be connected to a Modbus Master, such as an industrial PLC or SCADA system, through a PM180 6-channel local display. 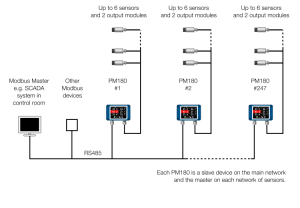 The PM180 has two Modbus interfaces – Master and Slave. It acts as both the Modbus Master on the sensor sub-network, and a slave device on the PLC/SCADA network. You can use the PLC or SCADA system to communicate directly with the sensors by adding an offset to the register address that you would use when polling the sensor directly. This offset depends on the sensor’s position in the PM180’s Sensor List (Settings – Modbus Master – Sensor List). For example, to communicate with a sensor in the third position in the sensor list, then you would add the offset for sensor list position 3, which is 0x1200 in hexadecimal or 4608 in decimal. Note: The Modbus slave address of the sensor does not affect the offset. If a sensor with address 1 is in position 3 on the sensor list, the offset for position 3 is used. The PyroMiniBus manual states that the register address for Filtered Temperature on the PyroMiniBus is 0x0E (15 in decimal). The length of the value is 1 word. The PM180 manual states that the address offset for the first position in the Sensor List is 0x1000 (4096 in decimal). Read 1 word from register address 4096 + 15 = 4111. It is also possible to connect up to 237 sensors directly to the SCADA system or PLC as individual devices, without using the PM180. However, by using sub-networks of sensors like this, up to 1,422 sensors can be installed on a single Modbus network. The FibreMini is suitable where both the target temperature and the ambient temperature are high, or where there is strong electromagnetic interference, such as near induction heating equipment.